After several decades of arguing, nearly to the point of fisticuffs, SMBAS birders have almost sorted out the differences between Elegant and Royal Terns. A few questions, a short run-through of differences, we move on, and only a few low grumbled invectives in the background. One down, 42 I.D. problems to go. This time it was a falcon. I always hope that Cindy is around to make these pesky raptor calls. I don’t consider myself an expert on much of anything, let alone underside views of lone raptors disappearing into the fog. After the bird flew out of sight, while some were still asking, “What did we decide it was?”, I located the person who, to my ears, seemed confident it was a Peregrine, and asked, “Why do you think it was a Peregrine?” As I said, lone birds in the fog are not my strong suit. The reply was something like, ‘I work with raptors and their recovery, so I’m familiar with them.’ I had been hoping for details of the bird, not of the person, and I repeated my question. “It was big;” possibly ‘strong flight’ was mentioned – I now forget. “Well, that’s weird, because it seemed both small and a bit fluttery to me,” I replied. A skeptic, I hold the ability of humans – including myself – to judge either size or distance of a bird, especially a lone bird, poor, at best. So there it is, for what it’s worth. I could not see any Peregrine head pattern on the bird, I don’t trust anyone’s size or distance impressions, the bird mostly soared, it ‘fluttered’ only at the very start when fairly low (perhaps it was just taking off). 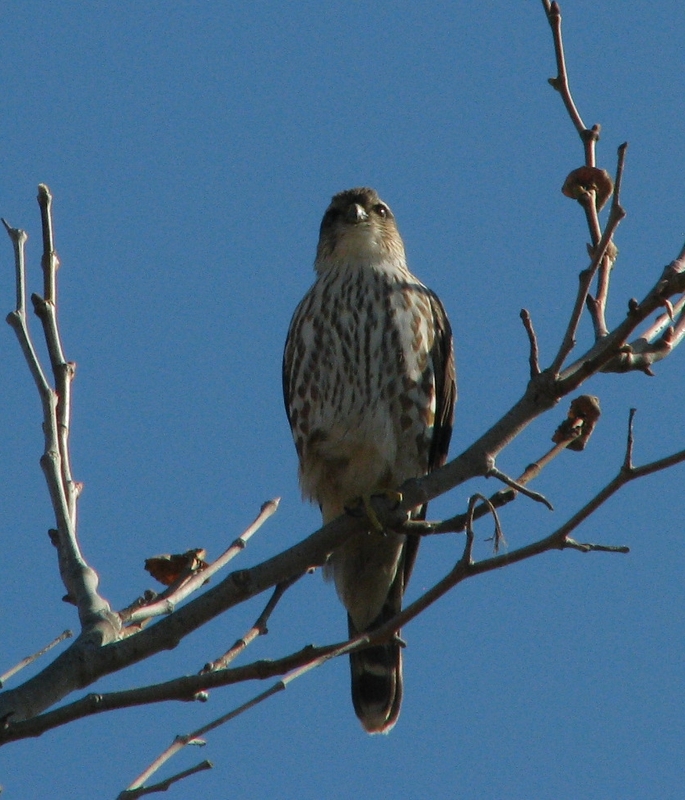 My 35 years of Malibu sightings yield the following August records: Merlin-1, Peregrine-0. Not much to choose from. I put it in the checklist as a Merlin. In other late-breaking news, there were 35 Snowy Plovers near the east end of the enclosure, no banded birds were seen. If there were any big feeding flocks offshore, it was too foggy to see them. Other new birds for the season were: Western Sandpiper; Forster’s Tern; Western Wood-Pewee; Western Kingbird; Rough-winged Swallow; House Wren; Orange-crowned, Yellow-rumped & Wilson’s Warblers; Lincoln’s Sparrow. The Sierra Club Trail Crew volunteers were kind enough to come a second month to pull weeds. I had hoped a few SMBAS members would be there, but it was only Jim Kenney and myself to join the very vigorous weeders. We spent about 3 1/2 hours pulling tobacco, fennel, pepperweed and excess willows from the driveway circle, and thinning out the nearby mulefat. If one could train goats to be very selective in their dining choices, it would be wonderful. Until then, humans must do the work. Many thanks to the Trail Crew. 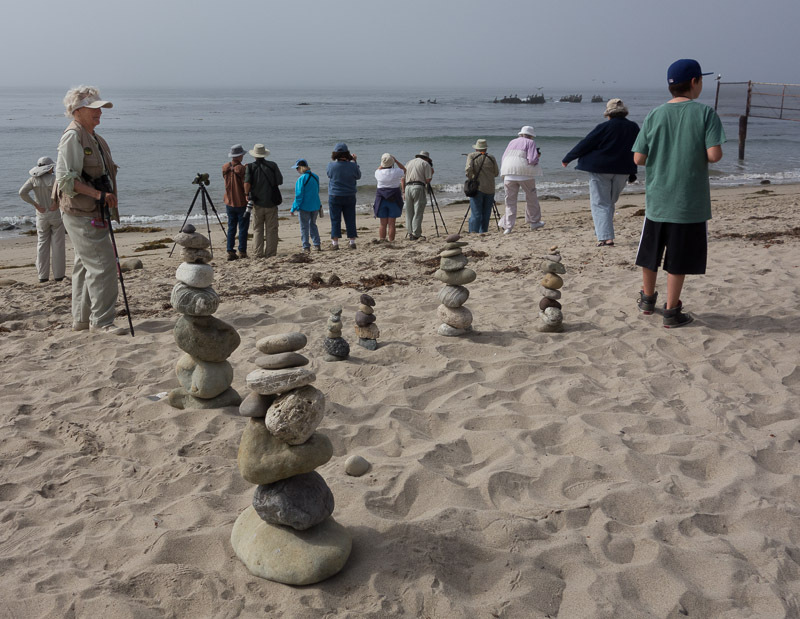 Our next three scheduled field trips: Malibu Lagoon Coastal Cleanup, Sat. 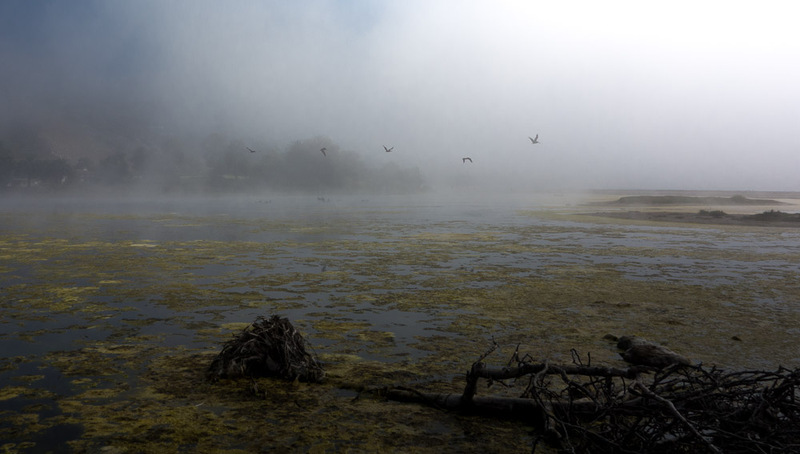 21 Sep, 9am; Malibu Lagoon, Sun. 22 Sept, 8:30 & 10am; Bolsa Chica Ecological Reserve, Sat. 12 Oct, 8:30am. Our next program: Tuesday, 1 Oct., 7:30 pm. Peru, presented by Mary Deutsch. NOTE: Our 10 a.m. Parent’s & Kids Birdwalks meet at the shaded viewing area. Aerial photo of Malibu Lagoon from 9/23/02. Prior checklists: July-Dec’11, Jan-June’11, July-Dec ’10, Jan-June ’10, Jul-Dec ‘09, and Jan-June ‘09. Total Birds: August total birds of 1154 are 37% above the 6-year average, an improvement from the Jan-Jun’13 period; pelican numbers rebounded; Black-bellied Plovers, Elegant Terns and Bushtits were well above average. Summary of total birds from the 6-year average so far: Jun’12 +36%, Jul’12 -9%, Aug’12 -9%, Sep’12 +12%, Oct’12 +3%, Nov’12 -5%, Dec’12 +30%, Jan’13 -20%, Feb’13 -29%, Mar’13 -30%, Apr’13 -34%, May’13 -37%, Jun’13 -24%, Jul’13 +83%, Aug’13 +37%. Species Diversity: August 2013 with 61 species was moderately above the 6-year average of 55. Summary of species diversity from the 6-year average so far: Jun’12 -10%, Jul’12 +10%, Aug’12. -6%, Sep’12 -20%, Oct’12 +5%, Nov’12 +2%, Dec’12 -4%, Jan’13 +2%, Feb’13 -8%, Mar’13 +9%, Apr’13 -2%, May’13 +3%, Jun’13 +13%, Jul’13 0%, Aug’13 +11%. Tide Lo/Hi Height L +2.9 H +5.7 H +4.32 H +5.03 H +2.59 L +1.31 Ave. Totals by Type 8/24 8/23 8/22 8/28 8/26 8/25 Ave.
Total Species 8/24 8/23 8/22 8/28 8/26 8/25 Ave. I just recently subscribed to your blog. I live in Pacific Palisades and have been photographing birds in the Lagoon and Legacy Park. I am sure you and your colleagues have seen the White Tailed Kites that have been hanging around the last few months. A couple of weeks ago, I watched one of the Kites swoop down on a rodent. The bird then flew to a tree near the pond in Legacy Park where it proceeded to eat said rodent. You can see the rodent in the claws of the attached photo. I thought you might enjoy this photo.